Cassia has always trusted their choices. It's barely any price to pay for a long life, the perfect job, the ideal mate. So when her best friend appears on the Matching screen, Cassia knows with complete certainty that he is the one . . . until she sees another face flash for an instant before the screen fades to black. Now Cassia is faced with impossible choices: between Xander and Ky, between the only life she's known and a path no one else has ever dared follow -- between perfection and passion. 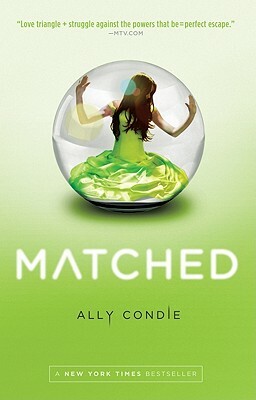 Where the Hunger Games and the Twilight saga began, so does Matched by new author . This is a young adult romance with some futuristic political intrigue set in a world where the "Officials" ration meals, and control almost every facet of a persons life, including the matchmaking of the teens to ensure proper emotional and genetically strong future generations. Sort of like E harmony on steroids. Our heroine, Cassia, is matched at the annual gala banquet with a long-time childhood friend, the handsome, charming Xander. To be matched with someone in your town much less your best friend is a very uncommon event to say the least, but when viewing the computer log of her beau's bio, a seeming computer glitch briefly flashes another friend's face on the screen thus planting the seed that maybe she was meant to match with Ky instead of Xander. However, Ky is not eligible to match since he is considered a lower caste member of this society -- ah, forbidden love. Ky also lives nearby (conveniently) which enables Cassia to seek him out and the two become close in spite of her being promised to Xander. This causes much unrest, confusion and ultimately a higher price than she would have imagined in her search for herself and her true destiny. While I didn't love this book, I did enjoy the way Condie brought poetry to both her own writing and as a shared secret to bring our young lovers together. I was sort of nagged by the thought that this love match might be more of a self-fulfulling prophecy rather than the real thing, and it left me wondering if Cassia questioned the authority of the Officials, why did she so easily accept that either boy would be right for her? I think the exploration of government conducting social experiments on its people was kind of a cool premise. I hope it's explored more in the sequel Crossed which is due out November, 2011 with the last book due the following year. Can anyone say next popular teen trilogy?